So What's Up With The Muslim Ban? On January 27, 2017, President Trump issued Executive Order 13769 ("EO"), titled "Protecting the Nation from Foreign Terrorist Entry into the United States." The EO stopped all Syrian refugees from entering the U.S. indefinitely, stopped all other refugees from entering the U.S. for the next 120 days, and put a 90 day ban on any people entering the U.S. from the following Muslim-majority countries: Iran, Iraq, Libya, Somalia, Sudan, Syria and Yemen. The roll-out by the Trump Administration was less than stellar, to say the least, with 100s of people detained in American airports, including permanent U.S. resident green card holders. Moreover, there was confusion internally within the Administration as to the details of the EO, such as whether green card holders or dual citizens were intended to be included within the ban (it was ultimately determined that they were not). The White House had not communicated or consulted with Congress or the State Department about the EO before its implementation. Several large companies, such as Google, Amazon and Expedia, requested many of their traveling employees to return to the United States immediately for fear of being banned from entering the country. Within hours of its implementation, dozens of lawsuits were filed all across the country challenging the constitutionality of the EO. One such lawsuit was filed by the states of Washington and Minnesota on behalf of their residents who were affected by the EO. The lawsuit, State of Washington & State of Minnesota v. Trump, was filed by the State of Washington's Attorney General's office, and later added the State of Minnesota to the action. The action was filed in the United States District Court for the Western District of Washington; Judge James Robart was assigned to the case. 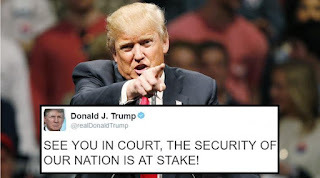 The action seeks a permanent injunction against the EO on the grounds that the EO violates the Constitution's 5th Amendment Due Process Clause because it deprives immigrants of liberty without due process of law, the 1st Amendment Establishment Clause because it prefers one religion over another, and various other federal statutes, including, but not limited to, the Immigration and Nationality Act. As soon as the lawsuit was filed, the State of Washington filed an emergency motion seeking a nationwide TRO to temporarily stop the EO from being implemented while the lawsuit is pending before the court. On February 3, 2017, Judge Robart granted the TRO blocking the EO while the action is pending. The next day, the Trump Administration filed an appeal to the United States Court of Appeals for the 9th Circuit. What Is A TRO And How Does It Work? Civil lawsuits often seek monetary damages but occasionally a civil lawsuit can ask the court to "do" something instead. We call this seeking "injunctive relief." The ultimate goal of such a lawsuit is to seek a permanent injunction either stopping somebody or something from doing something or, conversely, forcing them to affirmatively do something. Here, the States of Washington and Minnesota are asking the court to permanently stop the Trump Administration from implementing the EO. When a party is asking the court to intervene and do something in their favor, it is sometimes necessary to make an emergency request for a temporary restraining order, or TRO for short. A TRO, as the name implies, is merely a temporary order that a trial court judge can put in place very quickly while the court moves forward in hearing the merits of the case from both parties. Because it is only temporary (typically only lasting a few days), the parties do not need to present much evidence for a TRO. In fact, TROs are routinely granted at the request of only one party without even hearing the other party's side of the story. In such cases, the judge will grant a TRO and demand that both parties show up in court a few days later to present their arguments as to why the TRO should either stay in place or be removed. If, after hearing argument from both sides, the court decides to keep the TRO in place, the TRO becomes a preliminary injunction; "preliminary" in the sense that the injunction will only last for the duration of the lawsuit. At the end of the lawsuit, the court will make the ultimate determination on the merits as to whether it will grant the plaintiff's request for a permanent injunction. If so, the preliminary injunction is seamlessly converted into a permanent injunction. If not, the preliminary injunction is lifted. In order to be granted a TRO, a party has to show (i) a likelihood of success on the merits of whatever claims they are alleging; and (ii) that they are going to suffer "irreparable harm" if a TRO is not granted. What Happened In The Appellate Court? A panel of 3 judges heard the Trump Administration's appeal of Judge Robart's decision to grant the TRO (Note: this was not an appeal to decide the merits of the EO itself - just the merits of the TRO). 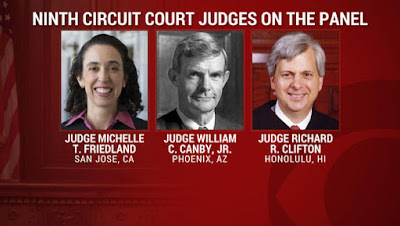 Among the 3 judges, 2 of them, Michelle Friedland and William Canby were appointed by Democratic Presidents Obama and Carter, respectively, and the third judge, Richard Clifton, was appointed by Republican President George W. Bush. 1. When a President makes an EO to ban immigration into the United States, it is within his powers as President and, therefore, is not a decision that can be reviewed by the courts. 2. Immigrants have no rights to Due Process under the Constitution, therefore President Trump's EO cannot possibly violate the 5th Amendment Due Process Clause. First, [the EO] denies re-entry to certain lawful permanent residents and non-immigrant visaholders without constitutionally sufficient notice and an opportunity to respond. Second, [the EO] prohibits certain lawful permanent residents and non-immigrant visaholders from exercising their separate and independent constitutionally protected liberty interests in traveling abroad and thereafter re-entering the United States. Third, [the EO] contravenes the procedures provided by federal statute for refugees seeking asylum and related relief in the United States . . . The procedural protections provided by the Fifth Amendment's Due Process Clause are not limited to citizens. Rather, they apply to all persons within the United States, including aliens, regardless of whether their presence here is lawful, unlawful, temporary, or permanent. (quotations omitted) (emphasis supplied). 3. The EO does not violate the 1st Amendment Establishment Clause because it does not discriminate against Muslims. The 9th Circuit reserved its consideration of this issue until the merits of this case have been fully briefed by both sides. 4. The EO is necessary to fight terror. 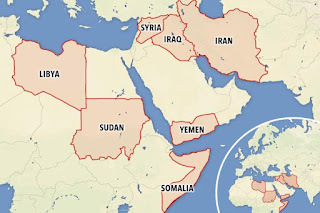 The [Trump Administration] has pointed to no evidence that any alien from any of the countries named in the Order has perpetrated a terrorist attack in the United States. Rather than present evidence to explain the need for the Executive Order, the [Trump Administration] has taken the position that we must not review its decision at all. We disagree, as explained above. At the end of the day, the 9th Circuit squarely rejected the Trump Administration's logic on most of the substantive points advanced in support of the EO. Accordingly, it ruled 3-0 to keep the TRO in place blocking the EO from being implimented. This would appear to signal that the Trump Administration is planning to appeal the 9th Circuit's decision to the Supreme Court. That would be an unwise legal strategy for a few reasons. First, the Supreme Court is not into taking cases to decide TROs. Deciding cases on the merits? Sure. Deciding cases at the TRO phase? Not so much. Keep in mind, at the TRO phase of a case, neither side has really developed a record of evidence yet or fully briefed their positions. In other words, its too soon. When the Supreme Court decides to take a case, it wants to see a fully developed record so that it can base its decision on something tangible. TROs don't present that opportunity. Second, let's just say for the sake of argument that the Trump Administration appeals the 9th Circuit's decision up to the Supreme Court. The Trump Administration just lost at the 9th Circuit level. The Supreme Court is currently comprised of 8 Justices, 4 conservative (including Kennedy the "swing" voter) and 4 liberal. At best, the outcome is going to be a 4-4 split down ideological lines. If a Supreme Court vote ends in a tie, then whatever ruling was made at the Circuit Court level is upheld. In other words, if the Supreme Court votes 4-4 then the 9th Circuit's ruling will stand and Trump loses. Again. Third, the 9th Circuit has just given the Trump Administration a blueprint for how the rewrite his EO so as to avoid constitutional challenges. The most effective course of action at this stage would be to withdraw the current EO - which would end this case in the 9th Circuit - and rewrite a new EO that follows the points made by the 9th Circuit. However, this would require Trump to admit that he got it wrong the first time and, well...we all know that's not going to happen. Fourth, there are other lawsuits working their way up through the courts in other Circuits. There's at least a chance that Trump could win in one of the other 12 Circuit Courts of Appeal. 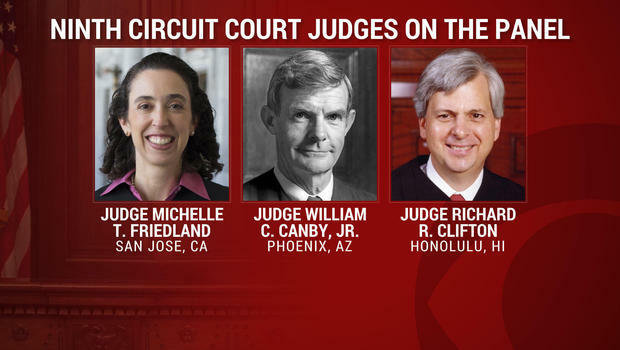 If he does win in a different Circuit Court, then it would be much more to Trump's advantage to spend the time and resources fighting that case before the Supreme Court rather than this 9th Circuit case. In that scenario, if the Supreme Court were to tie 4-4, the decision of the Circuit Court upholding his EO as constitutional would be upheld. Fifth, the Trump Administration seems to be having a lot of luck recently in terms of getting his cabinet nominees confirmed through the Senate. His latest pick, Neil Gorsuch, is a right-leaning judge. If Trump were to wait until after Gorsuch is confirmed on the Supreme Court, then the scales would tip back to a 5:4 conservative to liberal ratio. If that were to happen, appealing this 9th Circuit ruling would almost certainly be overturned by the Supreme Court (again, assuming that he can get the Supreme Court to hear a TRO case). So there are several reasons on why the Trump Administration should not move forward with an appeal of the 9th Circuit's ruling to the Supreme Court, and really only one reason to move forward with an appeal at this time: ego. Setting the appeal issue aside, it's also important to keep in mind that, as has been mentioned, this is only a TRO that was decided by the 9th Circuit. It was not, by contrast, an actual ruling on the merits as to the constitutionality of the EO itself. That is what will eventually be decided in State of Washington & State of Minnesota v. Trump. The District Court has not yet had a chance to make a ruling on the merits as to whether or not the EO is constitutional, and, similarly, whether a permanent injunction blocking the EO is warranted. In other words, Trump's Muslim ban is down, but it most certainly is not out. Trump is impulsive and likes to pick fights. Accordingly, he will likely charge ahead with an appeal of the 9th Circuit's ruling which, in all likelihood, the Supreme Court will probably refuse to even hear. And even if they do, Trump loses on a 4-4 split. We can also safely predict that this issue will now be at the center of the confirmation hearings for Trump's choice for the Supreme Court, Neil Gorsuch. Anyway you chop it, it looks like we're in for more fun times ahead for sure.